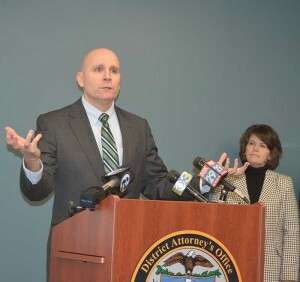 Chester County District Attorney Tom Hogan details charges against former Coatesville Superintendent Richard Como and former Coatesville High School Athletic Director James Donato, as the new Coatesville Superintendent, Dr. Cathy Taschner looks on. WEST CHESTER — Following the release of a Chester County Grand Jury report that reads more like a Mario Puzo novel than an account of the day-to-day operations of a school district, former Coatesville Area School District Superintendent of Schools Richard Como faces 51 counts of criminal charges for allegedly running a “skim” operation to divert district funds for his own uses. Former Coatesville Area High School Athletic Director James Donato — a former Kennett High School football coach and who also previously worked as a substitute teacher in the Unionville-Chadds Ford School District — faces 139 counts of similar charges. Both surrendered to authorities Monday and had preliminary hearings in District Court. 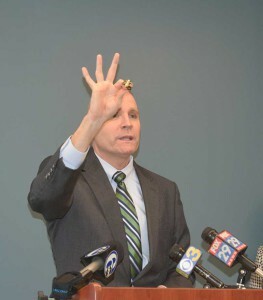 Chester County District Attorney Tom Hogan announced the charges as part of a lengthy and detailed press conference Monday at the Justice Center detailing the findings of the grand jury in a 108 page report released Monday (click here to read — caution, the file contains extreme and inappropriate language related to and quoting the texts). The report takes to task the Board of Education for failing to manage the district — and apparently cover up for Como and stonewall investigators — singling out former Coatesville NAACP president Tonya Thames Taylor for not being credible in her testimony. The report suggests that Taylor and other members were able to get jobs from the district through Como, with the implication that Como then was able to control them. The report also details an alleged web of lies by board members in attempt to deceive the public about Como’s status. The report makes a total of 13 recommendations for changes in how the district operates, many of which have been adopted already or are in the process of being adopted. Although the issues are now being addressed, what happened was unacceptable, district officials said Monday. Chester County District Attorney Tom Hogan discusses some of the racist texts exchanged between former Coatesville Area School District Superintendent of Schools Richard Como and Coatesville High School Athletic Director James Donato. Como faces charges of ethic violations, theft by unlawful taking, theft by deception, theft by receiving stolen property and dealing in unlawful proceeds among other charges. Donato faces similar charges and additional charges related to taking kickbacks for “free” use of district athletic facilities for sporting events. The two are alleged to have taken money from various events, illegally moved money around to pay for championship rings for the 2012 PIAA AAAA football runner up team and more. Both were forced to resign last fall after racist texts were discovered — even as an investigation into the pair’s financial conduct, as well as that of district solicitor James Ellison was already under way. Additional charges may be pending against other current or former district officials, including former district solicitor James Ellison, who billed the district roughly $6.9 million in legal fees between 2002 and 2013. Although the grand jury sought permission from the school district to waive attorney-client privilege to allow for a more full investigation into Ellison’s billing, it has been withheld up until now. Current Superintendent of Schools Cathy Taschner said Monday that she would take the issue up with new district solicitor Mike Levin and the Board of Education as soon as Tuesday. In addition to the charges of of Como and Donato skimming from athletic events, sports camps, falsifying expense reports and more to defraud the district of funds, the grand jury said Como had violated various ethic laws by hiring relatives (including his son Matthew Como, as ultimately the buildings and grounds supervisor for the district) and friends, many of whom were completely unqualified for their positions, or worse, known drug dealers. It also portrayed a Board of Education largely “asleep at the switch” allowing Como and Donato to basically run the school district more like a crime family than an educational operation. Hogan shows off one of the rings in question. The pair are charged with filing false expense reports and signing the district to deal requiring students to buy graduation and other products from Jostens — in order to cut down the price of the football rings, which look like something issued to a professional championship team. “The Grand Jury found many of the Board members – most notably Tonya Thames Taylor – to be deliberately obstructive and deceptive,” the report says. 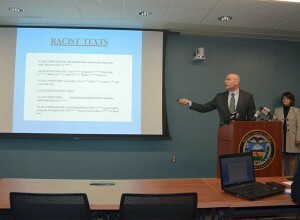 The report said that Taylor was notified of the racist texts by Theresa Powell on Aug. 17, 2013, the district Director of Middle Schools, who had been notified by Abdallah Hawa, the district Director of Technology, on Aug. 15, 2013, who discovered the texts on Donato’s phone after the athletic director turned in his old district phone for a new one. The two met with Taylor, the report says, on Aug. 16, and Taylor was allowed to read the messages. The report said that Taylor, Ellison, Hawa and Powell met on Aug. 17 at Scott Middle School and they again reviewed the messages. Ellison reportedly said that he needed to contact board president Neil Campbell and board vice president Robert Ritter to inform them. Ellison apparently instructed Hawa to delete surveillance camera footage of the four entering and leaving the building on the 17th. Hawa did not delete the footage and he saved a digital copy of the texts on Donato’s old phone, before giving the phone to Taylor on Aug. 19. Interestingly, according to district phone records, Taylor spoke with Como for three hours on the phone on the 18th — but claimed in her grand jury testimony that she did not discuss the texts. Taylor and Ellison apparently hid — the report said — the source of the information, claiming to the remaining members of the board that it come from an anonymous source, Leroy Coates and not Hawa. The report seems to suggest that the district “investigation” into the texting scandal was more about covering up, and looking for ways to discredit Hawa and Powell — and even look for grounds to fire them. “…it appears that the primary efforts made by the informed Board members (Campbell, Ritter, Taylor, Sweigart, and Dunn) in the days following the discovery of the text messages were to protect Como and to prevent the text messages from being publicly disclosed,” the report said. That effort failed when Rev. Sherry Deets alerted Hogan to the contents of the phone and offered that word was there were financial issues — even though Deets had no way to know that Hogan’s office was already looking at Como and Donato’s allegedly shady financial doings. The report said it was only at this point that the remaining board members, Diane Brownfield, James Fox, Paul Johnson, and Laurie Knecht were notified. The board then appeared to have actively covered up the incident — not addressing it during an Aug. 27 school board meeting, nor when the pair resigned on Aug. 29, just as school was starting. Ultimately, as the texts were leaked to the media — public furor rose and an angry public demanded answers, which were not forthcoming as the board refused to address the issue during board meetings. Hopefully, the board will keep close tabs on the next criminal they hired. But sadly, they haven’t since Taschner (Tazmanian Devil) hired her partner in demolishing schools Donahue ( Dummyhue).